Waiting for the curing of concrete can easily test patience, especially when you’re ready to move on to the next step of a project. However, it’s important to remember that quality is the end goal, not quickness. Rushing ahead and not allowing enough time for concrete to properly cure before allowing foot traffic or heavy machinery to travel across your newly placed cement can seriously compromise the integrity of a concrete slab. Mixture proportions- Increasing cement to water ratio will decrease setting time but may compromise long-term strength. Ambient weather/temperature- Higher temperatures decrease initial concrete setting time, but may decrease long-term strength. 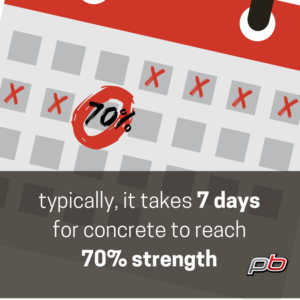 Typically, concrete is recognized to have reached full strength 28 days after placement; however, this does not mean you need to wait 28 days to walk, or even continue construction on newly placed concrete. After placement, concrete increases in strength very quickly for 3-7 days, then gradually for the next 3 weeks. This means that concrete hardening time is typically 24-48 hours, at which point it’s safe for normal foot traffic. After one week, concrete is typically cured enough to handle continued construction including heavy machinery. When in doubt, remember the “70 in 7” rule: Most concrete mixes will have reached 70% of specified compressive strength after 7 days. At this point, it’s ready for exposure to normal traffic. Unfortunately, cold weather during winter months can seriously slow down concrete cure time and significantly hold up construction projects. The best temperature to cure concrete is above 5o°F, which can be difficult to replicate if the air is below freezing. Luckily, solutions, such as concrete curing blankets that maintain optimum temperatures during cure time, are available. 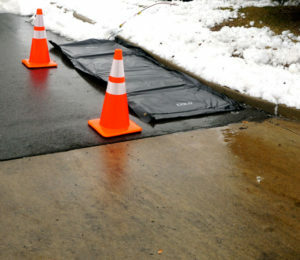 Concrete Blankets are an effective option that cure concrete 2.8 times faster than a typical insulated blanket and properly maintain moisture throughout the hydrating process. Concrete Blankets are easily transported and installed and maintain ACI compliance for cold-weather concreting. If you’re looking for a solution to maintaining optimum concrete cure time during cold winter, using a Concrete Blanket is the best method for drying and curing concrete.